Any porters out there interested in an external tool used in conjunction with Milkshape to construct your hardpoint/joint tree for your ships? This won't "position" the weapon and subsystem hardpoints. You will still use Milkshape to relocate the hardpoints to where you want them. This will setup your tree though for you with all the bits you want. I just started this two days ago and it's not yet operational but here is the interface. It will change before I'm done. I'm expecting to have the Tree View as seen in the shot plus a datagrid view for manually editing position and or rotation and comment data. The intention is for you to export either a model without any joints to a special file format then the tool will import the "Mesh Groups" and let you put together a tree from that starting point. The next phase will be the ability to take a ship that already has joints and export them and have them brought into the tool and retain their Position and Rotation and Comment data. Currently the Milkshape ASCII Importer which I intend to use to bring the data back into Milkshape does NOT Import "Comments". That's a bit dumb as the Milkshape ASCII Exporter DOES Export them properly. So I might look at making my own importer that will import comments, that is if I can figure out how. If I get the comments working I'll make an interface to make it easy to alter the Blink Pattern, Color, and Intensity of the sprite lights. 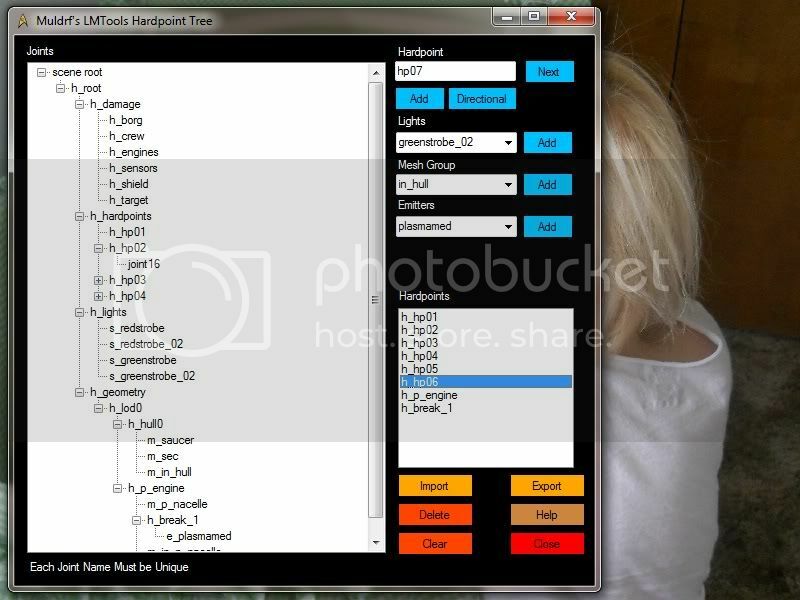 When your done editing your hardpoint/joint tree you will export it to a file. Then go back to milkshape and if your model already has joints you will have to manually delete them after that you will import the file that the tool created for you. Then you will have all the joints you had defined in it. Then all you have to do it reposition the weapon hardpoints etc. Once the phase 2 is done it will be able to retain the positions of any joints you had exported to the tool so they won't have to be relocated again. So here is the question. Does anyone see the use of the tool? Would anyone want to use it? Because if the answer is "NO" I will not complete development of it. The most time consuming part of making such a tool is making it "user friendly" and to put it nicely "user proof". If no one but myself will be using it, then I don't need to spend time on that part. I also wouldn't release a non user proof version of the tool because I would get to many complaints it's not user proof. That being said, I'd probably eventually make it user proof and release it, but without a need to focus on it that could easily be a year or so until I get around to it. Where if there is call for it's use I could have it user proof a lot sooner. 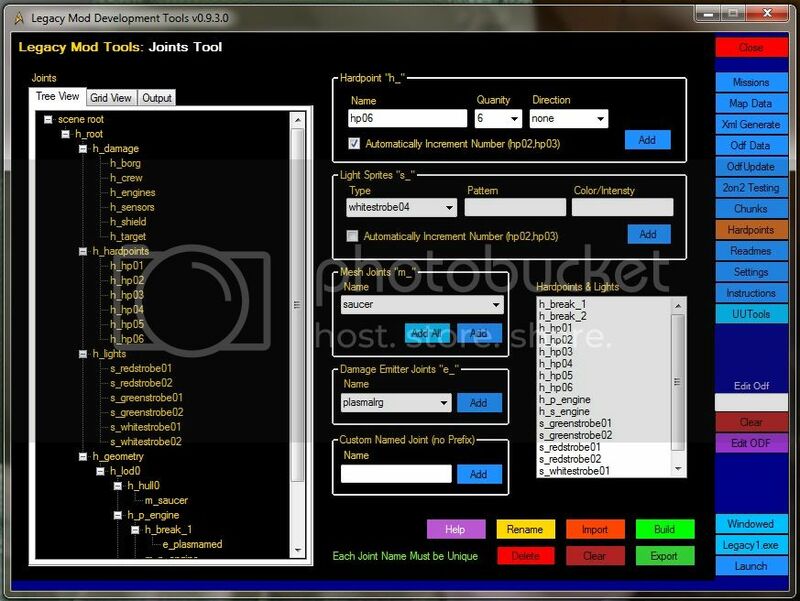 Also if there is call for it by current modders I could give out a beta individually to them for feed back. Well I got all of Phase 1 done, and setup most of the rest of the interface elements that will be setup later. I also moved it over into the LMTools. HP "Direction", Light "Pattern, Color/Intensity", and Joint Rename doesn't work right. Gridview tab that you can see is not setup yet either. All except Rename are Phase 2 items. The "Output" tab you see the top of is a preview window for the output file where you can make final alterations before saving the file. One thing I need to look into is changing joint order... See the order the joints are entered matters for objects that have "Alpha Transparency", the transparent object must have it's joint "below" all "solid" objects or it causes them to be transparent as well. I think this tool should work for Armada and Armada II joints as well. Hello Muldrf, my bad I didn't see this sooner(I really need to come back here more often LOL)but damn this is a frakin' great idea..keep going! As it is, you could use it for A1 or A2 if you know what the structres are because any joint can be moved, renamed or deleted, also the "Custom Named" joint type is literal for any joint type that doesn't exist in Legacy. I can set it up for A1 and A2, but I will need to know what the base tree should start out like, and any additional joint types and what they get setup as. I know nothing of A1 or A2 joint trees, only that they are "similar". If someone who knows A1 and A2 hardpointing wanted to give me the "base trees" and the other info I needed I can put it together. I can also give anyone a beta wants to try it out. I won't be finishing up the "Phase 2" parts until after the XI Pack is complete most likely. I made it to help me hardpoint the final ship of the pack as it was going to be a real monster. Well the wife is a bit under the weather, and the boys are tag team napping the last two days. So I couldn't work on the XI Pack. I've continued work on the Joint Tree tool though. I have put in the Datagrid view that is rigged for position, rotation, pattern and color output. Currently I don't have a working importer that will accept the "joint comments" which are what the pattern and color options are stored as so that's not in the output yet. The Position and Rotation are now in the output file based on their Datagrid/Grid View entries. I added Quantity option for the Light Sprites as sometimes you need a fair number of them created. Also the "Move Checked" will move any joint with it's checkbox checked to whatever your current selected joint is. I did that because of "breaknodes" and using the Mesh Group name import function, I "Add All" of the imported mesh group names to the hull0 joint then use the move checked to move all of the breaknode parts to the proper breaknode joint. That is if there are more than 1 or 2 mesh groups that need moved. To allow changing of the order of joints in a section I added the "Up and Down" buttons to allow that. So currently the Color and Pattern settings for lights are disabled in the interface as they don't work in the build/export function. Also currently it can only import Mesh groups and not existing joints or joint comments, but the framework is now mostly inplace to allow implementing it. 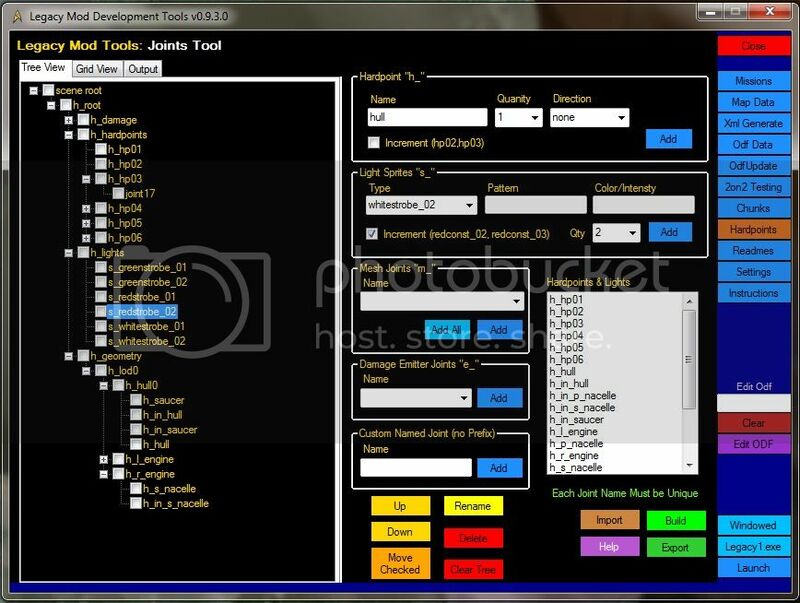 The latest working version of the Joint Tool has been released as part of an updated LMTools suite. It should be up at Legacy files once it is approved. The Joint Tool is a subtool of the LMTools. The tool allows importing of mesh group names from milkshape via a custom export that has been included in the latest Suite package. I plan to add the ability to import existing joint trees via using that same exporter in the future. It will retain any position and rotation data as well as comments on the joints. I don't know when I'll get around to doing that. It's not like a get a "huge" influx of LMTools users, if there is direct call for it from atleast someone then I'll look at it sooner, otherwise I'll do it when I get around to it. This early release of the updated LMTool is due to the serious improvements to my ModInstaller utility which is also part of the Suite. The MonInstaller utility was updated to support installation of the XI Pack I have been working on and finally released (also awaiting approval). It has some bugs corrected in it. I had issues with the custom sound references not installing properly to the csv files. Also the Free Camera and Save button enabling for Stock Legacy wasn't working for me. It also can now install ships to more than 1 race during the installation process. It can also insert a map editor menu entry into the map editor menus. There is a more arcane modification to the sprite installation feature that I doubt will find a use in the future again, I only added it because Miri's new XI Weapons needed it. I have done a fair bit more work on the tool recently. The interface is the same as the last release (minus the one debug button that shouldn't have been in the last release). There are some additional columns on the "Grid View", but they are only used by the Import process and have no impact on anything else. I implemented the ability to import existing joint data. I tested importing some joint "trees" from existing models as well as the Armada, Armada II and Fleet Ops trees that dEjavU' send me early on. I also fixed a number of issues. The thing that started me on it, was that I tried to make a video showing how to use to tool in it's "current released state". I ended up finding some bugs and some things that needed to be changed. I fixed up the problems I found, and finished up the joint import functions. I still have some testing to do, but I'm not sure when I'll get the chance to really sit down and test it right. If everything checks out when I test it, I will be submitting another updated release to Legacy Files for the LMTools Suite with the new and improved Joint/Hardpoint tool and joint exporter. I know of 2 minor things that need adjustment at this time, but each is a easy and fairly quick fix.